To be sure, there have probably been many scientists and pseudo-scientists who take this easy route, letting a theological commitment bypass the hard work of natural science. For those people, I say, shame on you. But lets not rush to judgment either. It’s not clear at all that intelligent design is intrinsically tied to this habit of being a “science stopper.” Quite the opposite is true. Perhaps I can illustrate. Which is more interesting, studying the random lines of water running down a window in the rain? 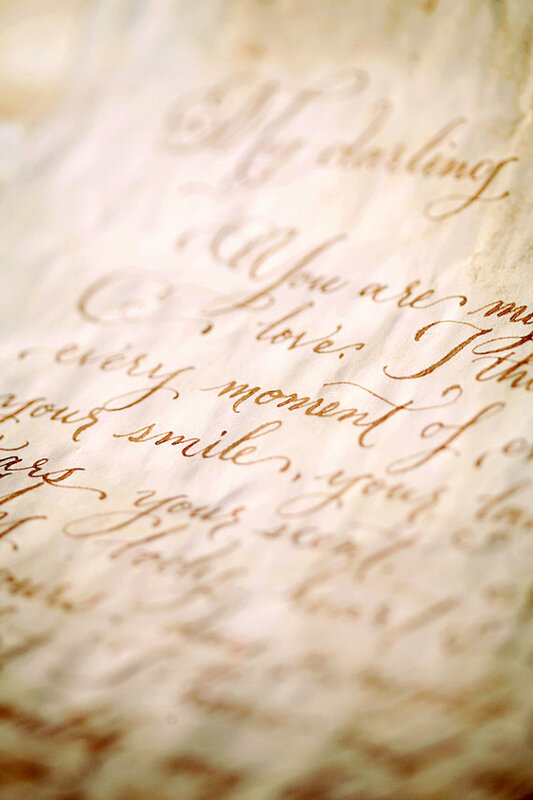 Or studying the meaningful lines of writing from a loved one in a letter? The first can, perhaps, submit to all sorts of scientific measurements and naturalistic description. And I’m sure there are people who make a living trying to formulate predictive models about how water trickles down on vertical glass surfaces. That’s not a total waste of time, but lets be honest. The love letter is far more interesting to us. Knowing that there is a designing cause, and in this case a personal cause, behind this discovery makes it that much more interesting and worthy of study. There are people who study different sounds in nature, but there are probably a whole lot more people studying the intelligently designed sounds of music; where notes are rendered on purpose, with artistic interests in mind, perhaps even to tell a story and signify things besides the music itself. The impulse to understand, question, discover and study is not hampered by the design inference, it is strengthened. When nature’s ways belie meaning, design, and purpose, they become more interesting, not less; we are all the more curious, more intrigued, more hungry to know the how and why behind it all. To be fair, the design inference does risk introducing an irreducible causal nexus–the designer. And much of modern science hinges in reductivism, wherein everything is assumed to be reducible to other “smaller” things. It may be totally outside the ability of science to give any sort of exact description of this “designer.” That may be the job of philosophers or theologians. However, it’s not as if Intelligent Design has halted science here though. Every account of anything ever given eventually arrives at some irreducible point, where we cannot yet find any substrata beneath it, or our technology fails us, or our comprehension fails us. Plus, intelligent design can also shift the reductive analysis to telos, thus sustaining that scientific curiosity. In other words, intelligent design allows that features in nature manifest design, or what is variously called purpose, intention, or telos. This last term is where we get the notion of teleology (nature is thought to operate as directed towards goals). Reductive scientist assumes no such things exist–and they typically do this since modern scientists have widely rejected teleology (at least) since Darwin. But intelligent design theorists allow that such things may exist. Nature may have latent purposes built into it, such as a shark sensing temperature changes for the purpose of detecting prey or people protecting orphans because they should care others. For intelligent design theorists, they need not squelch their curiosity when apparent purposes seem to be at work; they need not redirect their energies, against their intellectual integrity, to explain away what seems readily evident. They can instead scientifically explain what is within their ability to explain, and press ever upward and ever onward in greater explanations precisely because the potential for teleology in nature is boundlessly intriguing. Natural science might be doable without much appeal to design. But it can be far richer and far more interesting when the possibility of design is allowed in, at least where no satisfactory naturalistic explanation can be found. Personal explanations have always been and will always be an intriguing possibility inspiring and driving people towards clearer and better accounts of nature facts.